$6.88 No fumes. No toxic chemicals. A gentle liquid cleaner made with baking soda that effectively works on grease, grime and dirt indoors and outdoors. Plus - it’s a floor cleaner, no need to rinse. It’s a litter box cleaner and a natural deodorizer. Squirt a little on a wet sponge or cloth to clean daily messes. No ammonia smell. Pleasantly scented with oil of orange. Biodegradable. 32 oz. It does not contain petroleum distillates, chlorine bleach, phosphates, ammonia, synthetic colors or perfumes. 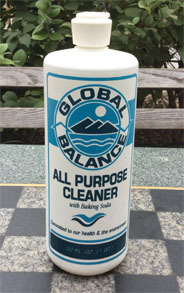 A multi-purpose spray cleaner that is good for the planet, safe for use in your home and safe around kids and pets. Pleasant light citrus scent. Cleans and shines beautifully. Cuts grime. It does not contain phosphates, allergens or dyes, synthetic fragrances or chemical preservatives. Biodegradable. 22 oz.